Posted originally on: October 6, 2016 by	James. Last modified: December 6 2018. There are comments. Is incorporating in HK right for me? Hong Kong is a good base to incorporate your business and open a bank account – it offers simpler frameworks and regulation around company taxes, a general ease when dealing with multi-currencies, 0% corporation tax on offshore profits, reasonable accounting rates, plus its position in Asia means that for digital nomads or location independent professionals who spend time in the area its an accessible and good place to run a business from. Trusted banks: The banks in Hong Kong include some of the biggest and best brands in the world – HSBC, Citibank, Bank of China, DNC Bank and many more. Latest technology: E-banking is everywhere – perfect for those who don’t plan to be based in Hong Kong and need all the facilities of their account. Multiple-currency friendly: Dealing with multiple currencies and getting them in to other currencies at great rates is straightforward and easy. 0% profits on foreign income: This is why you are reading this article. 0% corporation tax on foreign earned income. So anything outside of Hong Kong could be 0% tax. And that includes China. For income originating inside Hong Kong, the tax rate is 16.5%. Lenient regulations: Regulations around business accounting and auditing are more lenient. Where countries like the UK or Germany may be very strict about what can be classed/taxable as a business expense, you will find that Hong Kong allows for much more to be included, reducing any tax the company may owe, and reducing the amount of personal income you need to take from the business. Companies will like you: Western companies trust HK companies. Chinese companies trust HK companies. Its one of the best suited locations for dealing with the fastest growing markets around the world. Payment processing available: Unlike offshore territories with poor banking regulations, Hong Kong’s gravitas in the banking world means that Stripe, PayPal, Braintree and numerous merchant processors are available for you to process online payments if needed. Business bank accounts are hard to open: Basically, its all the Americans fault. Since FATCA was introduced in mid 2014, opening a bank account has gradually got harder and harder. And now in 2016, the crackdown from the US and subsequent problems they cause for HK multinationals has meant that opening a bank account now involves a lot of luck, a lot of paperwork and possibly, no bank account to go with the business you just registered. More on this below, plus a hack that might help some businesses. Off-shore tax exemption takes time to get: What used to be a fairly simple process has now become something that can take 4-8 months of back and forth with the IRD to achieve, all of which costs you money for your accountant to deal with. Setup fees are high: The costs of setup for a HK company are 10x higher than setting up in the UK. No easy or cheap ways to set everything up: If you cut corners, try to do things yourself (like in the UK) and not use an agent, chances are you’ll mess everything up, and not get tax exemption status, and not get a business bank account. If you are gung-ho with your application or details, you won’t be successful in Hong Kong. I haven’t heard of anyone able to open a company and bank account with a 3rd party (so without personally visiting HK) since 2015. So if you are looking at opening a business in Hong Kong, book some time in the country to start going through the motions and bear in mind that you may have to return within a few more months to finalise things. Many countries have similar requirements, and for HK company, you need a HK-based address and company secretary. Chances are you won’t need an office yourself or have workers to play these parts. Luckily, these are easy to get by using an agent, and for a small fee, you can have a business address in Hong Kong, with a company secretary appointed. Filling in the company formation documents is time consuming, and the off-shore status tax exemption paper work is long winded. You need an agent or accountant to deal with this to make its all done properly. Its extra expense, but its needed. 100%. You need to make sure you apply for “off-shore status” to ensure your company is subject to 0% tax rate. Company kit fee (450-1,500 HKD/£80/$100) – this varies from agent to agent, its stuff like printed Memorandum of Association, share certificates, which is worth getting. Often called Green Box. Off-shore tax exemption fee (6,000 HKD/£635/$775) – this varies wildly as it depends on how easy or hard the IRD makes your claim for tax exemption. This is based on approx. 10 hours of work from your accountant. Bank account opening fee (1,000 HKD/£105/£130) – a reputable agency will be able to advise you the best bank to go with that suits your needs. Taking all the above in to consideration, you are looking at an average cost of around 13,000 HKD (£1,400/$1,600) in charges plus a bank deposit to get a HK company setup and running. This is not exhaustive – but as you can see, if you start working with HK companies, or start importing stuff from Alibaba and its going via Hong Kong, then you may run in to problems. There are lots of resources online about this. Some of these things could be rectified with small changes to your business (target adverts at Asian customers and start selling), or changes to your financial structure (open a business account with HSBC in UK – or in other country – and build 6-12 months trading with them). It may be that the bank you are approaching is not interested in your business. In this case, try other banks – Bank of China or DBS bank have recently been found to make opening a business account easier than HSBC. Is incorporating in Hong Kong right for me? If you have been refused a business bank account, or you think the scrutiny of your business won’t pass, there is TWO simple hacks for your business depending on how you run it. This is perhaps best for app developers or affiliates, who just get bank deposits of their earnings, rather than needing advanced banking facilities. The first hack is simple: Just open a Hong Kong personal bank account in your own name. Places like Amazon Affiliates, iTunes Store and Google Play allow you to change where payments are made too easily, and it means you can still take advantage of the HK incorporation and taxes. This isn’t perfect, and not for everyone, but it may help some people out. The second hack is to use Neat. Neat is a new fintech startup out of HK and is similar to Revolut and Fire from UK. You can get approved for a HK bank account in minutes, get a debit card and have access to your funds via the app. It’s super cool. They have also started to offer business bank accounts. When I setup my account, I was lucky – I used an agency to do everything for me; it was a painless process, and got my bank account and business up and running in 3 weeks. I didn’t even need to visit Hong Kong. I used CompanySec, which was based on a recommendation from someone who has been using them for 4 years. They are upfront about fees, as well as upfront about subsequent year fees. They are not the cheapest, but offer a good service. These costs look high, but when you take in to account UK corporation tax of 20%, you only need to be making a profit of £6,000 for these costs to make more sense, and for the benefits of incorporating in Hong Kong to be clear. If you want to spend the money your company is earning and take a salary you need to pay personal income tax depending on the country you are living in. This will depend on where you are resident of (i.e. where you passport is from), and where you are tax resident (often the country where you have the most ties too, or spend more than 6 months of a year). Your personal tax liability is not something I want to go in to with this blog, however, I will say that the company tax regulations in Hong Kong are a lot more adaptable than a lot of other countries, so once incorporated you may find that more of your day-to-day living expenses can now be classed as a business expense. And that means you need to withdraw less salary, which means you will pay less tax regardless of where you live… Also bear in mind that many countries offer lower tax rates on dividend payment from your company profits. Food for thought. There are plenty of other countries that offer 0% tax — Isle of Man / Guernsey / Jersey / Bahamas / Bermuda / Cayman Islands, hell, Delaware or Texas in the US. I haven’t really looked in to them. Wanting to be based in SEA and wanting to do more business in mainland China meant that Hong Kong was a perfect choice for me and my projects, it hasn’t been done to avoid tax. See more offshore bank options. Get advice from a tax advisor in your home country, and the country you are thinking of moving too. In fact, get as much tax advice as you can, as every interpretation is different. Having a Hong Kong company does not give you rights to stay and work in mainland China. You will need to get a visa to work in the mainland, or if you want to be there often, you may want to look at incorporating in China too. Deloitte have published a great guide on Hong Kong tax (personal and business) and its worth a read. 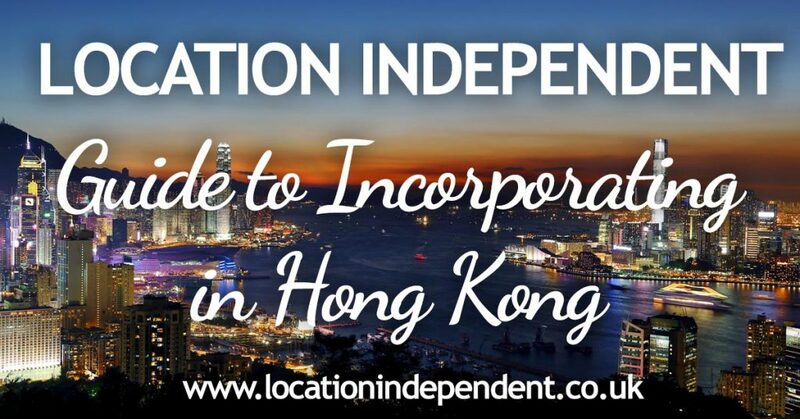 There is a new Facebook group to discuss Hong Kong incorporation, join it to get the latest information. Note: Nothing in this article should be construed as financial advice. It is for information only. Things change, so always be careful, and seek professional advice or second opinion if something does not feel or sound right.